I am probably going to replace the Televes DAT 790 that I have with a UHF only antenna. I also have a Delhi VIP 302 SR for VHF that I would like to use. I have read that the now discontinued Winegard HD 8800 is about the best in the lower UHF range. But I have also read a couple of reviews from users that claim that even the Antennas Direct DB4e is a better antenna. And Antenna Hacks also ranks it third in a shoot out between the DB8 and new CM 4228. Any ideas? I would prefer a 4 or 8 bay at this point. Given the small yard and space that I have a vertical antenna is preferable to a horizontal antenna. 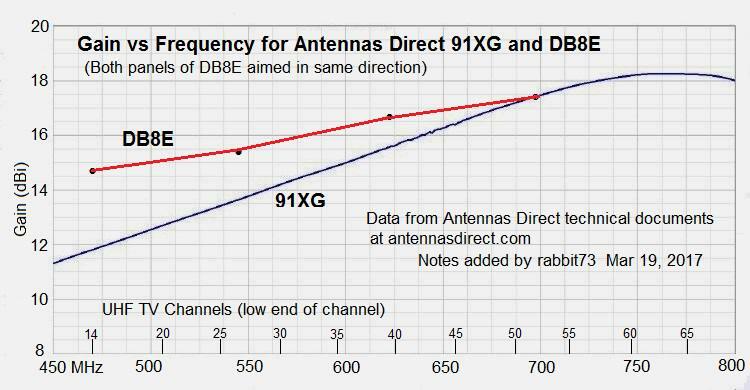 The current best UHF only 14-30 antenna is the Antennas Direct DB8e, because it, and the DB4e, were rescaled to improve the gain at the low end of UHF when the band was cut to 14-51.